Applications are available here and are due by June 9, 2017. 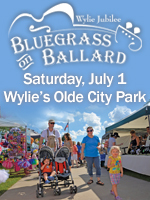 For more information, visit their website or contact their event coordinator at carole.ehrlich@wylietexas.gov. Sponsorship opportunities including booth space, please call Craig at 972-516-6016 or email craig.kelly@wylietexas.gov.